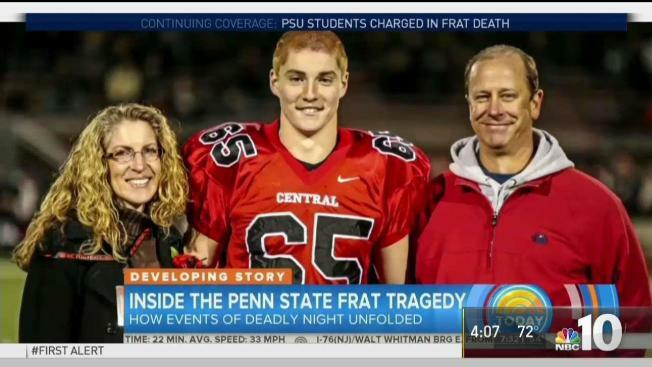 Judge Steven Lachman also threw out allegations that a member of now-shuttered Beta Theta Pi had erased basement security video to thwart investigators, and dismissed all reckless endangerment counts the defendants had faced. All 11 face at least one count of hazing and at least one alcohol-related charge for the events that occurred the night in February 2017, when Tim Piazza suffered a series of falls and was badly injured inside the fraternity house. Piazza, 19, of Lebanon, New Jersey, died of severe head and abdominal injuries after a night of drinking that followed a pledge bid acceptance ceremony. He fell down a set of basement steps, and the amount of alcohol in his system has been estimated at three or four times the state's legal limit for driving. After a separate preliminary hearing, another judge previously sent charges against 14 other members of the fraternity to county court for trial. Lachman dismissed all three charges that Braxton Becker, 21, of Niskayuna, New York, had faced over the allegedly deleted security video — evidence tampering, obstruction and hindering apprehension or prosecution. A message left for his lawyer was not immediately returned. A spokesman for the attorney general's office said he would soon issue a comment on the decision.